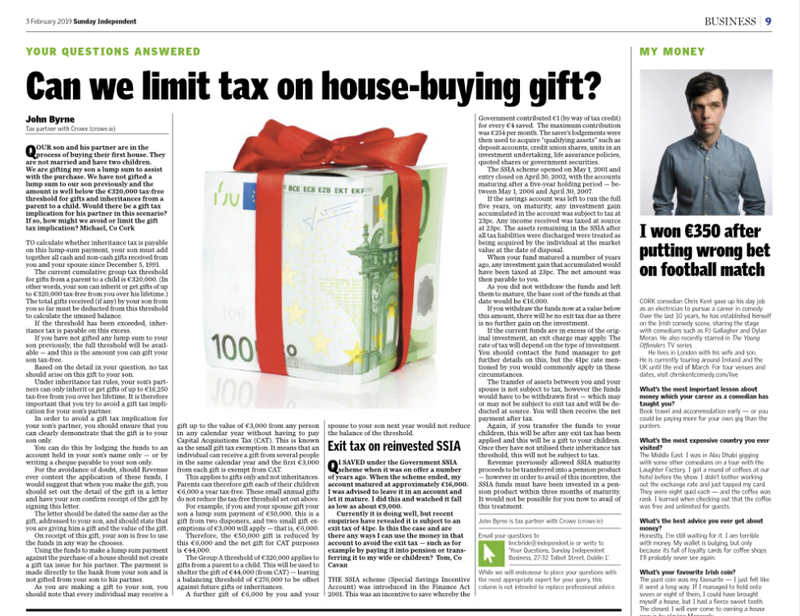 Crowe tax partner, John Byrne, answers Sunday Independent readers’ personal finance questions. The following is an extract from the Personal Finance section from the 3 February edition of the Sunday Independent. Query: Our son and his partner are in the process of buying their first house. They are not married and have two children. We are gifting my son a lump sum to assist with the purchase. We have not gifted a lump sum to our son previously and the amount is well below the €320,000 tax-free threshold for gifts and inheritances from a parent to a child. Would there be a gift tax implication for his partner in this scenario? If so, how might we avoid or limit the gift tax implication? Answer: To calculate whether inheritance tax is payable on this lump-sum payment, your son must add together all cash and non-cash gifts received from you and your spouse since December 5, 1991. The current cumulative group tax threshold for gifts from a parent to a child is €320,000. (In other words, your son can inherit or get gifts of up to €320,000 tax-free from you over his lifetime.) The total gifts received (if any) by your son from you so far must be deducted from this threshold to calculate the unused balance. If the threshold has been exceeded, inheritance tax is payable on this excess. If you have not gifted any lump sum to your son previously, the full threshold will be available – and this is the amount you can gift your son tax-free. Based on the detail in your question, no tax should arise on this gift to your son. Under inheritance tax rules, your son’s partners can only inherit or get gifts of up to €16,250 tax-free from you over her lifetime. It is therefore important that you try to avoid a gift tax implication for your son’s partner. In order to avoid a gift tax implication for your son’s partner, you should ensure that you can clearly demonstrate that the gift is to your son only. You can do this by lodging the funds to an account held in your son’s name only – or by writing a cheque payable to your son only. For the avoidance of doubt, should Revenue ever contest the application of these funds, I would suggest that when you make the gift, you should set out the detail of the gift in a letter and have your son confirm receipt of the gift by signing this letter. The letter should be dated the same day as the gift, addressed to your son, and should state that you are giving him a gift and the value of the gift. On receipt of this gift, your son is free to use the funds in any way he chooses. Using the funds to make a lump sum payment against the purchase of a house should not create a gift tax issue for his partner. The payment is made directly to the bank from your son and is not gifted from your son to his partner. As you are making a gift to your son, you should note that every individual may receive a gift up to the value of €3,000 from any person in any calendar year without having to pay Capital Acquisitions Tax (CAT). This is known as the small gift tax exemption. It means that an individual can receive a gift from several people in the same calendar year and the first €3,000 from each gift is exempt from CAT. This applies to gifts only and not inheritances. Parents can therefore gift each of their children €6,000 a year tax-free. These small annual gifts do not reduce the tax-free threshold set out above. For example, if you and your spouse gift your son a lump sum payment of €50,000, this is a gift from two disponers, and two small gift exemptions of €3,000 will apply – that is, €6,000. Therefore, the €50,000 gift is reduced by this €6,000 and the net gift for CAT purposes is €44,000. The Group A threshold of €320,000 applies to gifts from a parent to a child. This will be used to shelter the gift of €44,000 (from CAT) – leaving a balancing threshold of €276,000 to be offset against future gifts or inheritances. A further gift of €6,000 by you and your spouse to your son next year would not reduce the balance of the threshold. Query: I saved under the Government SSIA scheme when it was on offer a number of years ago. When the scheme ended, my account matured at approximately €16,000. I was advised to leave it in an account and let it mature. I did this and watched it fall as low as about €9,000. Currently it is doing well, but recent enquiries have revealed it is subject to an exit tax of 41pc. Is this the case and are there any ways I can use the money in that account to avoid the exit tax – such as for example by paying it into pension or transferring it to my wife or children? Answer: The SSIA scheme (Special Savings Incentive Account) was introduced in the Finance Act 2001. This was an incentive to save whereby the Government contributed €1 (by way of tax credit) for every €4 saved. The maximum contribution was €254 per month. The saver’s lodgements were then used to acquire “qualifying assets” such as deposit accounts, credit union shares, units in an investment undertaking, life assurance policies, quoted shares or government securities. The SSIA scheme opened on May 1, 2001 and entry closed on April 30, 2002, with the accounts maturing after a five-year holding period – between May 1, 2006 and April 30, 2007. If the savings account was left to run the full five years, on maturity, any investment gain accumulated in the account was subject to tax at 23pc. Any income received was taxed at source at 23pc. The assets remaining in the SSIA after all tax liabilities were discharged were treated as being acquired by the individual at the market value at the date of disposal. When your fund matured a number of years ago, any investment gain that accumulated would have been taxed at 23pc. The net amount was then payable to you. As you did not withdraw the funds and left them to mature, the base cost of the funds at that date would be €16,000. If you withdraw the funds now at a value below this amount, there will be no exit tax due as there is no further gain on the investment. If the current funds are in excess of the original investment, an exit charge may apply. The rate of tax will depend on the type of investment. You should contact the fund manager to get further details on this, but the 41pc rate mentioned by you would commonly apply in these circumstances. The transfer of assets between you and your spouse is not subject to tax, however the funds would have to be withdrawn first – which may or may not be subject to exit tax and will be deducted at source. You will then receive the net payment after tax. Again, if you transfer the funds to your children, this will be after any exit tax has been applied and this will be a gift to your children. Once they have not utilised their inheritance tax threshold, this will not be subject to tax. 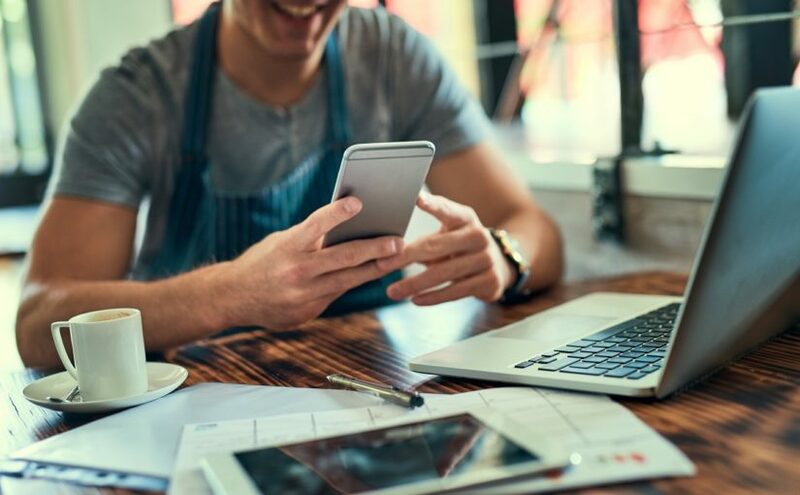 Revenue previously allowed SSIA maturity proceeds to be transferred into a pension product – however in order to avail of this incentive, the SSIA funds must have been invested in a pension product within three months of maturity. It would not be possible for you now to avail of this treatment. For additional information on inheritance tax, or any personal tax matters, please contact a member of our tax team.